Hot Rave Pink Contact Lenses Glow under the Black Light! Perfect for Dance Parties. If you like purple or violet or pink then these are awesome for you. - freak and freaky eyes. Are you raving about the color pink? 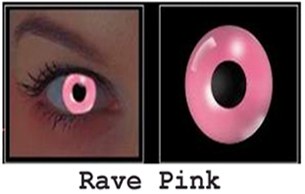 Show off your eyes as soon as the lights are dimmed and party all you want as your Rave Pink lenses glow a bright, flashy color! Order your pair now only at cococontacts.com. •The lenses expire 90 days from the day of opening. • These lenses ARE FOR cosmetic use ONLY. •The crazy wild lenses do NOT come IN prescription. • These lenses ARE a soft contact lens. * Please Consult an optometrist before use. Due TO Health Laws, we ARE NOT permitted TO take returns ON lenses.